The waters of Yellowstone Prong spring from the peaks of the Great Balsam Mountains and gather themselves in Graveyard Fields. Born from springs above 6,000’ and purified through the 5,000’ meadow, these waters run crisp and clean. The perpetually cool waters flow peacefully through the hanging valley before plunging down a raucous ravine which leads to the Prong’s confluence with the East Fork of the Pigeon River. From the mouth of Graveyard Fields the Yellowstone Prong cascades over the mighty Second Falls and then the secluded Yellowstone Falls. A short distance downstream the Prong makes its most risqué drop over Skinny Dip Falls. At this popular swimming hole a series of cascades and plunge pools line the banks of a heavenly ravine. A short, .5 mile walk from the Blue Ridge Parkway, leads to Skinny Dip falls where you can cool your body and refresh your soul in the wild waters of Appalachia. 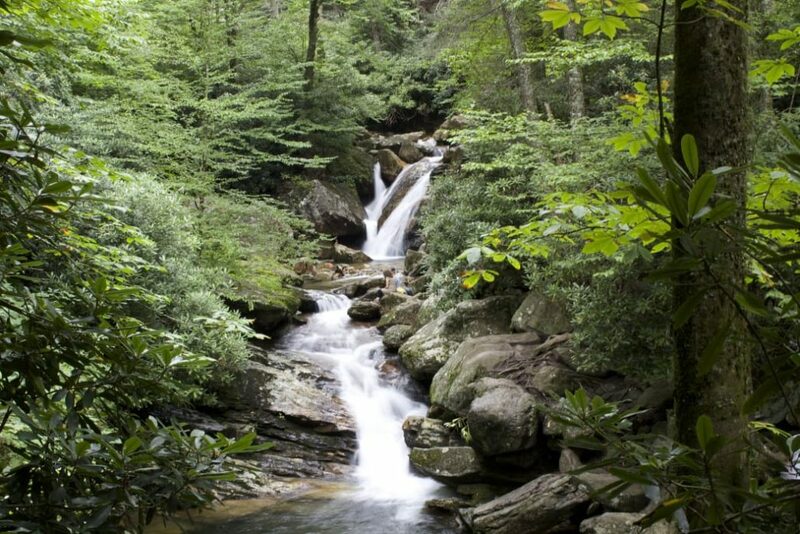 Access to Skinny Dip Falls can be found right off the Parkway from the Looking Glass Rock overlook. Across the Parkway, from the overlook, a blazed spur trail leads into the woods. After taking this trail and entering the woods you will notice an Indian “Trail Tree,” which was formed as a trail marker by indigenous tribes. Perhaps they also enjoyed taking a dip, skinny style, in the Yellowstone Prong? After passing the ornate tree – some say the face of a dragon can be seen in its gnarled bark – hikers will come to an intersection with the Mountains-To-Sea trail. Veer left at this intersection and follow the rocky trail until reaching the swimming area. When you reach a wooden staircase leading to a bridge spanning the creek, you have arrived! Enjoy yourself in the series of plunge pools, but please keep your clothing on if there’s a crowd. The falls are Skinny Dip by name only, not by nature during busy hours. A grouping of Boulders along the right side of the upper pool provides a platform to jump into the 6’ deep water. Use caution and make sure to hit your mark if you decide to take the leap off of the 8’-10’ rocks. The lower pools of Skinny Dip Falls are serenely beautiful and offer wading and lounging opportunities on their sun-soaked rocks. Thanks to such easy access Skinny Dip Falls has become a highly popular area for families and adventurers. On warm summer days you are likely to share the water with a crowd. Fear not though, there are plenty of pools to spread the watery wealth. This swimming hole is in the vicinity of some incredible hiking trails. The Art Loeb, Mountains-to-Sea trail, Black Balsam Knob and Shining Rock are all within striking distance. Take a hike, then cap off your adventurous day by soothing your aching muscles in the waters of Skinny Dip Falls! From Asheville catch the Blue Ridge Parkway near our Diamond Brand Outdoors’ South Location. Pick up your last-minute supplies there and then head south on the Parkway towards the Looking Glass Rock Overlook, located by mile marker 417. Parking here is free but you may want to get there early on pretty summer days to find a spot. Dogs are welcomed but should be kept on a leash until they are ready for a swim!